I survived my annual weekend trip to Taupo and the 160km Cycle Challenge around the lake. On the Saturday we riders were exposed to a strong headwind off the lake for the final 50kms and as I hadn’t recovered from an epic cold I had been struggling with, achieving a sub-5hr ride was never a strong likelihood. Still, I left nothing in reserve and put it all out there on the road. I finished absolutely hollowed-out in 5hrs 8 mins at my ninth attempt. There’s always next year, eh? That night L and I joined members of a long-standing Wellington cycle peloton, the OTBs, for dinner at a local restaurant Vine Bar and Eatery. They produce tasty Mediterranean shared-plates food, and had a great NZ wine list. I started off drinking Terra Sancta Mysterious Diggings Bannockburn Pinot Noir by the glass, which was a solid 3, but my mate M offered me some of his Elephant Hill Syrah 2012, and it was much better. BTW this wine won Champion Syrah at the 2013 Air New Zealand Wine Awards. 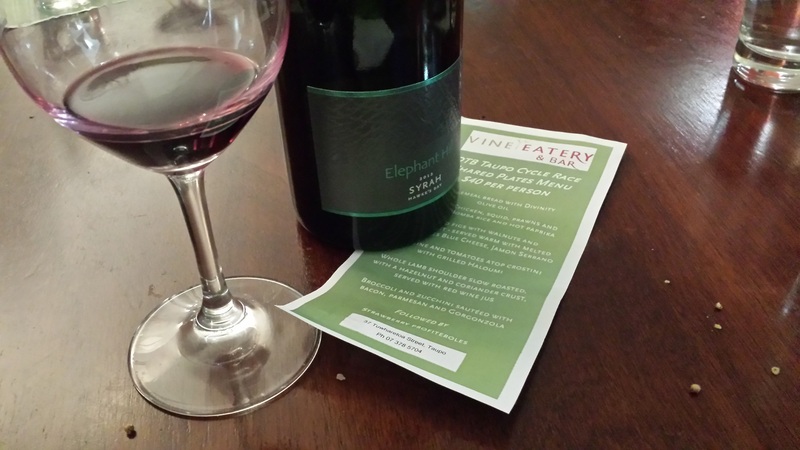 I don’t know why the winery is called Elephant Hill. Elephants are not native to NZ, and there is currently only one elephant alive in the entire country. Maybe there’s a hill nearby that looks like an elephant…? This entry was tagged $$$, 13.5%, 2012, 3, 4.5, Central Otago, Elephant Hill, Hawkes Bay, Pinot Noir, Syrah, Terra Sancta. Bookmark the permalink.